Is Yellowstone gonna blow? Sure. Will everybody die? Sure, absolutely. But there is pretty much no connection between the first question and the second. Yellowstone caldera will in fact erupt again some day; it's a forty mile wide caldera with a huge magma chamber miles deep in the crust. That's the reason there are geysers there, and all those hot springs. And everyone will die, eventually. That's kind of a rule about living. But worrying about whether I'm gonna die from an eruption at Yellowstone is so far down my list of concerns that I am more worried about being gnawed to death by a pack of angry prairie dogs. It could happen, but it is highly unlikely. 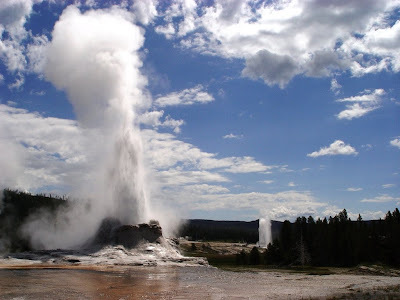 I'm writing on the subject because a commenter asked for my take on the news this week about the activity around the Yellowstone caldera (for the record, "supervolcano" isn't a geological term). My best advice, before I finish with my own two cent's worth, is to check out the Eruptions blog here and here. Erik Klemetti does some excellent analysis of the story and how quickly things can be overblown by a media that thrives almost exclusively on spectacle, and has little use for reasoned discussions of the actual risks. As I considered the question of an 'informed' response, I had to wonder if I'm not guilty of the same sort of exaggeration and sensationalism of cable news and other media. In my pursuit of educating others, I am not above discussing lurid tales of death and geological mayhem. After all, when I talk about volcanoes in class, I lead with Krakatoa, Tambora and Pompei, and I discuss the potential effects of a gigantic rhyolite caldera eruption such as those that took place at Yellowstone three times in the last two million years (not to mention broadly equivalent eruptions at Valles Caldera and Long Valley Caldera). I have a clear conscience on the matter, because I follow up with a discussion of the actual risk and probability of such events happening to our time; an eruption like the Yellowstone Caldera happens somewhere in the world every few hundred thousand years. Smaller, but certainly dangerous eruptions like those of Tambora (1815), Krakatoa (1883) and Katmai (1912) happen somewhere in the world on a scale of decades. And when these events take place there are clear signals that something is about to happen. 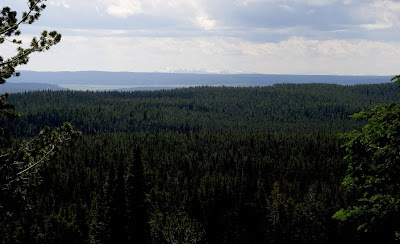 So, the Yellowstone Caldera floor rose around a foot during the last decade (that's the caldera in the picture above; I was standing on one rim, the mountains in the far distance form the other rim). There was an intrusion, a sill, that was filling and inflating with magma. There is nothing unusual or particularly alarming about this, as Yellowstone is an active magma chamber, and such events are normal. Although it has been 70,000 years since the last eruption in the park (and more than 600,000 years since the so-called 'supervolcano' eruption), it could happen again, but any activity would be accompanied by many other phenomena that would provide plenty of information about the scale of the eruption and the hazard to people in the region. My take? 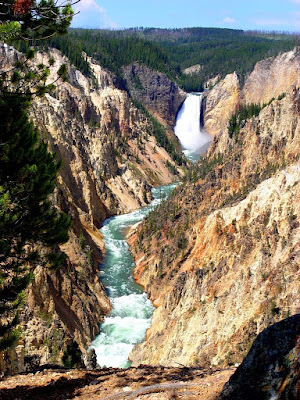 Learn about Yellowstone; it is a fascinating place, worthy of our attention and worthy of protection as a crown jewel in our national park system. But worry about the end of civilization as we know it in a vast explosion of fire and volcanic ash? No, there are other problems that we need to think about. The best quote on the matter? From Max Read at Gawker: "But who do you trust, some kind of "professor," or your overactive imagination?" To which I might add: "But what about professors with overactive imaginations?" 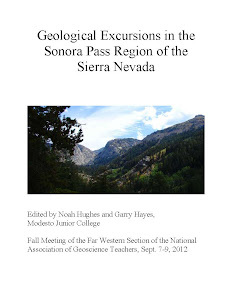 I hereby challenge my fellow geobloggers (and any newbies who want to participate) to explore the interconnections between geology and food. This can take any form you want, but I’m really hoping for some edible, geologically accurate models. Yummy stuff that illustrates and informs about earth science? Yes, it is possible! The end of the semester in my historical geology class is usually accompanied by a social gathering, and an interesting cake is usually in the mix. The picture above was a complicated mess befitting of the subject, an ocean-continent convergent boundary, i.e. a subduction zone. The brown is the region of a magmatic arc, where magmas rise to the surface forming a series of andesitic stratovolcanoes (the red glob on the right is the molten rock!). The yellow strip is the forearc basin, a shallow sea where sediments form thick layers. The only piece I can't make out specifically is the accretionary wedge, unless the blue is not ocean water (ironic, given the name of the carnival). 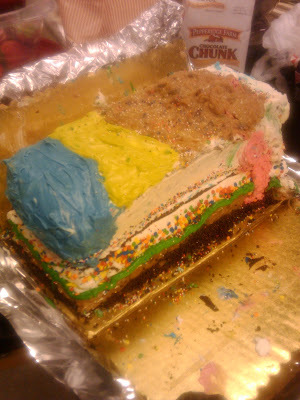 I'm not sure how to interpret the rest of the layers, but I can report that they were tasty! 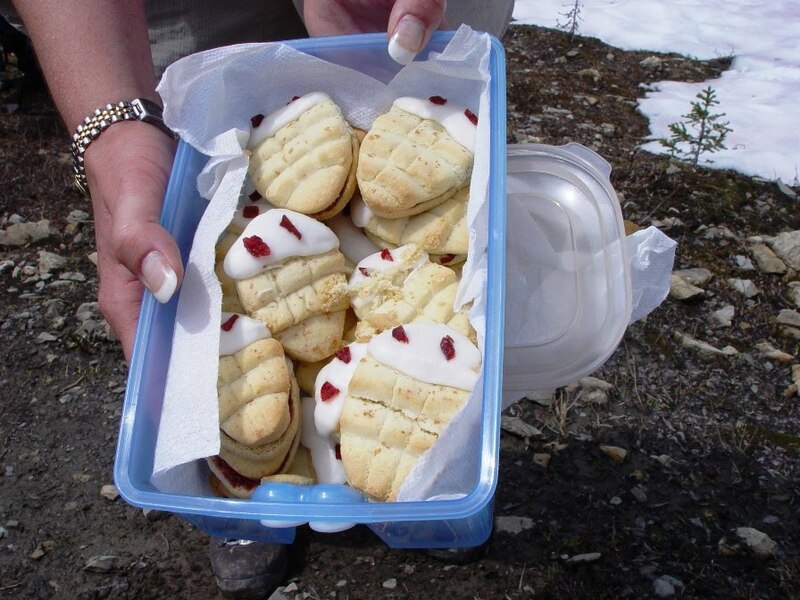 Edible education took a different turn a number of years ago when I had the chance to see Walcott's Burgess Shale quarry in British Columbia (one of my very first blogs was on the subject). The site is considered to be one of the most important fossil discoveries in the world as it yields up thousands upon thousands of soft-bodied Cambrian animals. This is important because usually only hard-shelled creatures are ever preserved. The Burgess fauna gives us a glimpse of the complete ecosystem that existed at the "dawn" of complex life around 510-515 million years ago. As one might expect, the quarry is carefully protected, and collecting could actually land you in jail. So we thought it interesting that our guide promised that we would all get a trilobite of our own if we survived the six-mile hike to the quarry. The "trilobites" are below! So what was Geotripper doing providing advice on human relationships on a geology blog yesterday? Randy got it exactly right, I was teaching chemistry! Haven't you ever wondered what holds the world together, how a bunch of supermicroscopic atoms can stick to one another and form such beautiful rocks and minerals? A great many people might be interested in knowing, but feel intimidated by the level of knowledge seemingly required to understand such things. To understand a crystal, one needs to know of protons, electrons, neutrons, elements, and bonding. 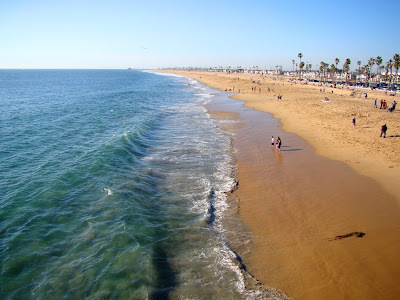 To fully understand an earthquake or a tsunami one needs some basic understanding of the behaviour of waves. To understand the twinkling of a star in the sky, one needs some grounding in the nature of the electromagnetic spectrum. It is a tall order, but not impossible. The knowledge is there for anyone to comprehend if they wish to...I will explain the specifics of our Dear Gabby advice at the end of this post. 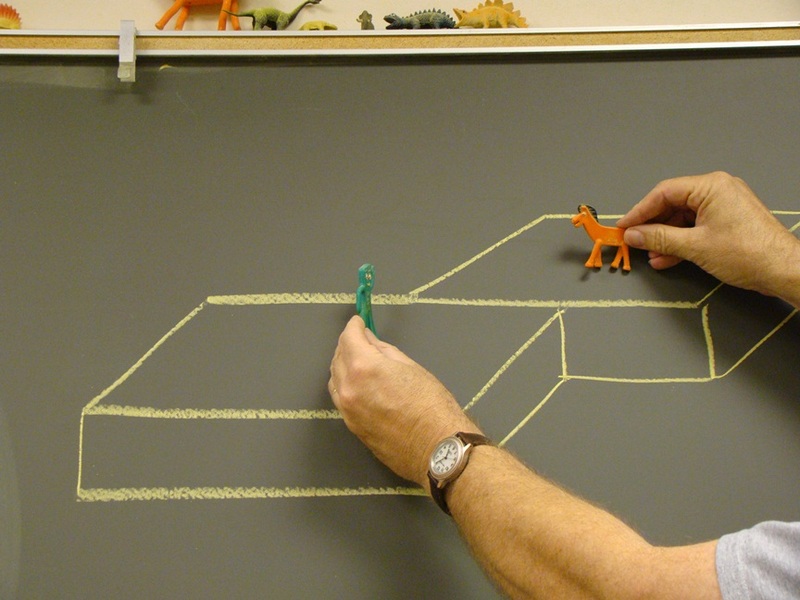 Geology and the earth sciences occupy a special place in the academic universe. They are the very tangible examples of chemistry and physics at work in the real world. Not the strange world of atoms and smaller objects where Newtonian physics falls apart into strange new rules. Not the vastness of an unimaginably strange Universe. It is the ground beneath our feet, the flooding of a nearby river, the shock of an earthquake, the price of gasoline at the local pump. It is the prediction of next week's snowstorm, the drought of the next decade, and sea level rise in the next century. It is the planning for the end of an oil economy. An understanding of the earth sciences is critical to making the best choices in resource use and allocation in an overpopulated world. 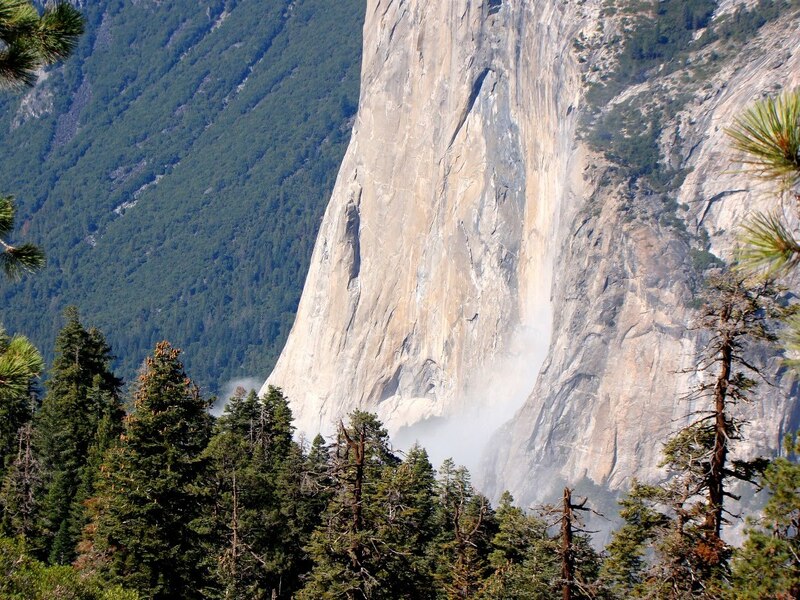 National parks and monuments are not generally established because they preserve some aspect of physics and chemistry. 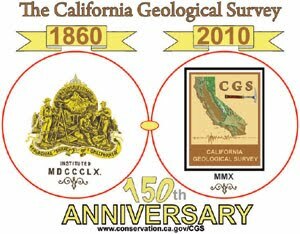 If they don't preserve a historical battleground or unique plant or animal, they are there because something of geology is worthy of our interest and protection. 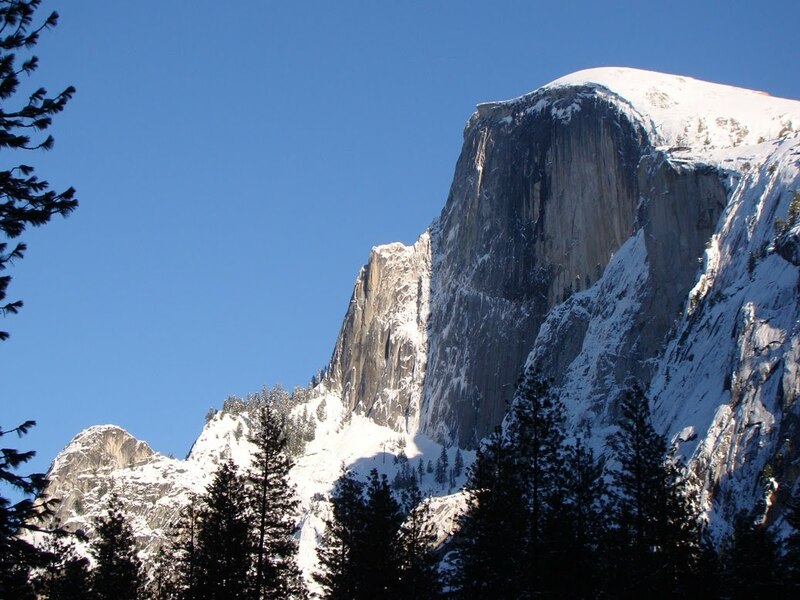 We may photograph the bears, deer and squirrels that inhabit Yosemite, Yellowstone or Grand Canyon, but the meaning of the parks is in the rocks. The squirrels live everywhere, but the geysers, rock strata and gorges make these places unique. 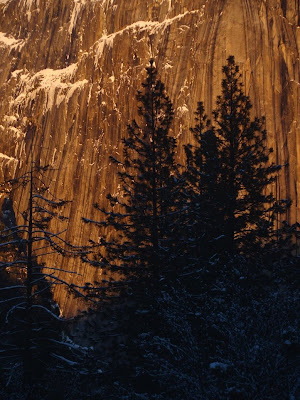 Communicating the meaning and value of these parks to society is prime concern of the park's interpretive rangers. That brings us to the challenge. To be a geology/earth science major, one needs to be a real polymath, a Homo Universalis (look it up! I had to). It is generally recognized that the candidate needs to master calculus, physics and chemistry, usually in classes that has him or her competing directly with actual math, physics and chemistry majors. It is not the easiest major to pursue. In an ideal academic world, the geo-major would have prerequisites in all of these listed fields before ever setting foot in a physical geology course. This is not feasible or possible in my world of the community college. A prerequisite like that would leave me with three or four students each semester (hmmmm....that's a thought). Our community colleges serve many constituencies and few of my students will actually end up as majors. They will become teachers, nurses, accountants, firefighters, small business owners and so on. They take a geology/earth science class for many reasons, but most often because it is one of the listed physical science lab electives they need for their general education requirements. Our goal is not to produce geologists and earth scientists (although it is nice when that happens), but to produce an informed community of educated citizens. So, I have the challenge (and privilege) of assisting my students in understanding some basic principles in physics and chemistry without getting bogged down in aspects of the sciences that they won't need in order to understand introductory geology. Chemistry is covered in about 2 hours and 40 minutes. The boiled down version of chemistry that I present would probably appall my colleagues down the hall, but they will have time to fix it when my students take a chemistry course a semester or two later. In the meantime, the students will have more than enough to try and understand; why not make it as memorable as possible? 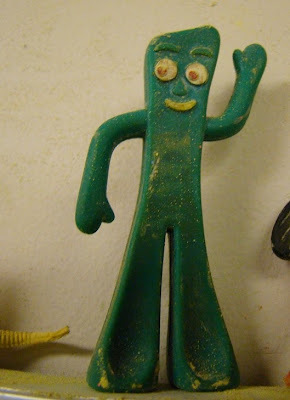 They tell us we should not anthropomorphise inanimate objects like atoms (atoms don't "want" to do anything or "behave" in a particular way, they just act according to the laws of physics). But that sort of takes the fun out of explaining atomic activity. So...atoms are in fact couch potatoes, in the sense that they exist and react in such a way as to maintain a stable low energy state. This generally involves having a specific number of electrons in the outer energy shells. They achieve the stable outer shells by giving up or taking in electrons from the local environment, i.e. from or to other nearby atoms. This leaves atoms in an ionized state, meaning they now have a positive or negative charge. The oppositely charged particles are attracted to each other to form an ionic bond. Other atoms achieve stability by merging their orbiting electron shells and sharing the fast moving particles. Such outer-shell electrons are called valence electrons, and the bond is a covalent bond. 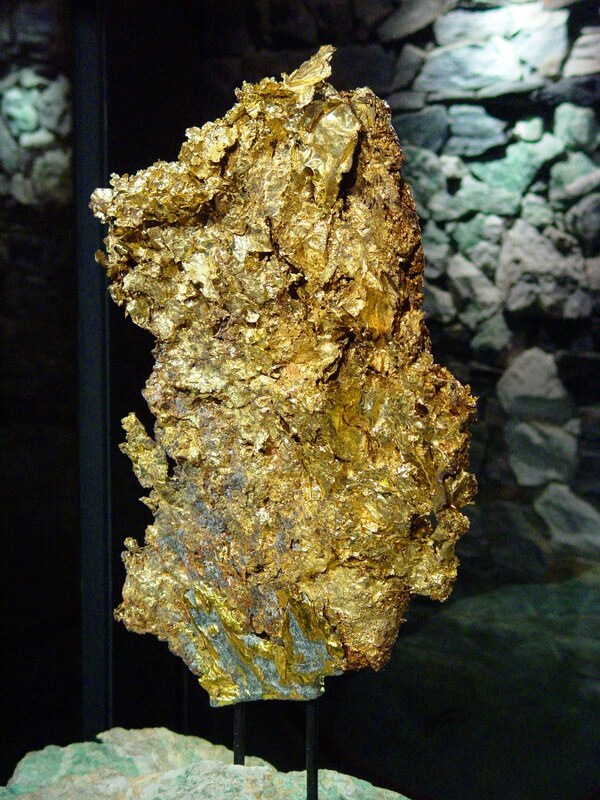 In some minerals like gold, silver or copper, the electrons flow freely throughout the solid and are not tied to any specific atoms, a so-called metallic bond (ever wondered what electricity actually is?). And as Randy points out, the noble gases already have filled outer electron shells, so they don't react or bond with other atoms at all. These elements include helium and argon gas. A moment of truthfulness here: I was actually thinking of the very weak Van der Waals bonds, but the example of the noble gases works much better as a metaphor of non-commitment! 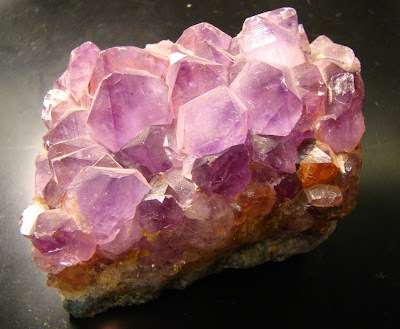 The next step is to understand how these bonds lead to the formation of the crystals (and crystalline solids) we find scattered throughout the crust of the earth (such as the amethyst quartz above). I love crystals, not for spiritual new age reasons, but for the assurance they provide us that there is order in the Universe. They are beautiful reminders of the accomplishments of atomic couch potatoes seeking that nirvana of the lowest energy state possible. I just don't understand human relationships. I'm lonely, I want to be with other people, but I just don't get it. What can I do?? It is said that in love, opposites attract. But sometimes one does all the giving, the other all the taking. In olden days, before "domestic relationships", "living together" and "shacking up", there was once something called "cohabitation". In the 1960s there was something called "free love", a sort of joyful noncommitted relationship. But with some, there seems to be a problem with any kind of strong commitment. Good luck with your search for bonding with others! People have been calling my hubby a "couch potato". I don't get it. What is a couch potato? A couch potato is one of those people whose sole ambition is to expend the least energy possible. Think about it. I'll bet that hubby spends his day prone on the Lazyboy Lounger, and exercises by pressing his thumb on the remote, and communicates with the rest of the household by shouting "get me a beer, honey", because he is so darn lazy he can't rise and do it himself. He may only get excited when the television transmits a touchdown, but he soon sinks back down. I'm sorry, but he will never change. I suggest going to a CPA meeting, Couch Potatoes Anonymous. 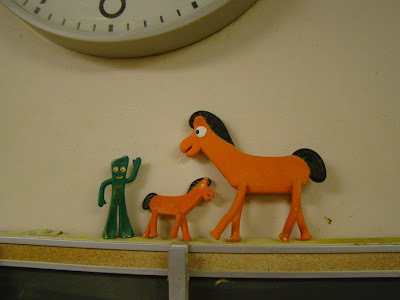 So of course, the dear readers of this blog are saying "what the heck does this have to do with geology, O Geotripper??? 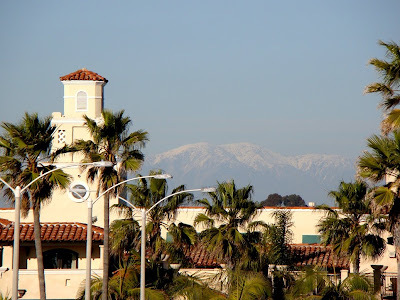 How can you tell it's still winter in Southern California? How can you tell it's still winter in Southern California? There are some definite clues in the picture above, though you may have to look closely. I'm not gloating or anything; I live in Central California under some of the most pernicious gloom and cold damp fog imaginable. But I grew up down this way, and I have dreams sometimes of the gorgeous weather. I'm not down here for a happy reason (a funeral for a grandmother), but it's nice to see a beautiful day, and to see some family I haven't seen in a while. 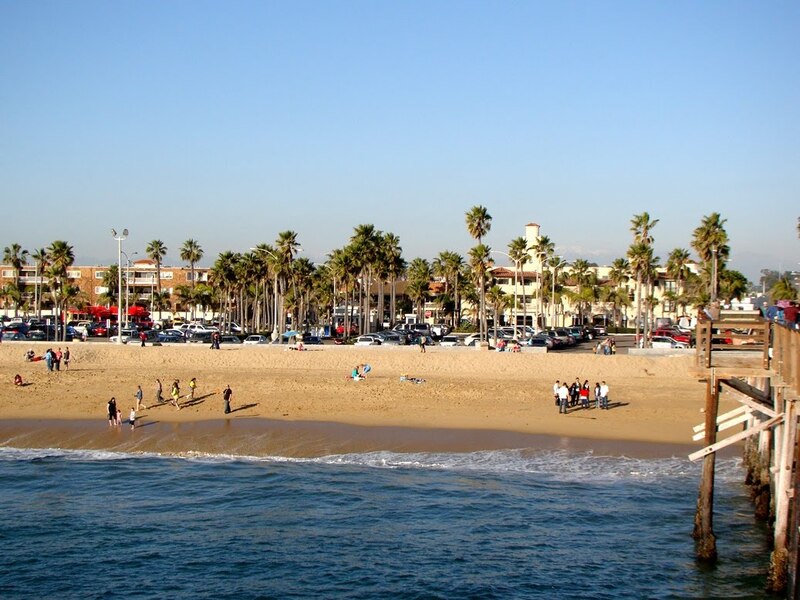 People like to make jokes about the traffic, the floods, the earthquakes, the smog, the urban blight, and all the other stereotypes of SoCal, but there are reasons that 20 million plus people have chosen to live here, and the winters have to be pretty high on the list. Ah, yes, that's Mt. Baldy, and number one winter clue is, you can actually see it from Balboa, and number two, it's still got snow on top! Clue number three appears below: there are slightly fewer people actually in the water! Silver Fox over at Looking for Detachment has occasionally posted some favorite road songs and something about the idea struck a chord with me (no extra charge for puns). So much of work in the field involves music, whether to keep one company on a long road, or to dispel the darkness beyond camp. It sometimes seems like a primeval urge to chase away the darkness with firelight and chanting (though, since I'm not likely to be eaten by a sabertooth, I embrace the darkness and the starry cosmos too). I often carry a guitar in the field, and offer my students a sample of songs for the road. I have to admit, they are polite, but don't often know the songs I sing. From somewhere deep in the wells of my past, I've amassed a repertoire of folk songs that are invariably sad, songs about hitting bottom, songs of lost loves, songs of betrayal, and songs of missing home. Townes Van Zandt, for instance, or Gordon Lightfoot. And no resolution, either. I have Gordon Lightfoot's version, and I love it, but the soaring harmonies of Peter, Paul and Mary take the song to a whole different place. Old folk songs touch on deep emotions that we spend a lot of time and effort to avoid feeling. The water is wide, I can-not cross o'er. Andrew Alden over at About.com Geology mentions a skill and privilege that geologists and rock/mineral lovers need to remind themselves they have: Permission to Play! In other words, get out and have some fun looking for stuff. 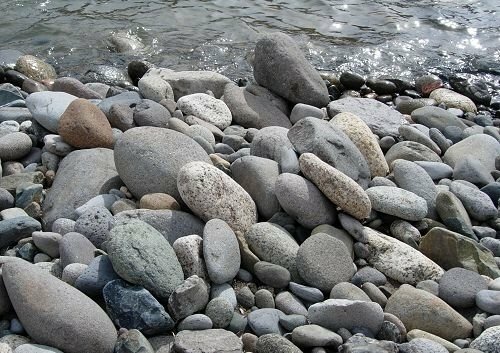 I live in the middle of California, in a place that at first glance does not offer many chances to build a collection of nice specimens of rocks. I thought about this a few years ago when I was trying to help some teachers build collections of classroom specimens of common rocks and minerals. I put together a brief guide to hunting for rocks in Central California. I've reproduced it below in the hope that some of our local rock-lovers will go out and play! 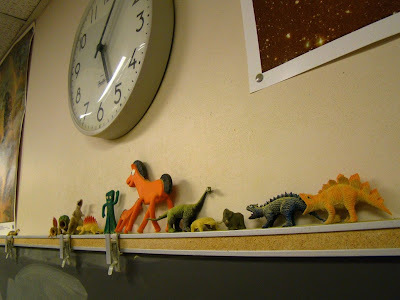 Living in a flat valley as we do, one may be tempted to think that it will require a lot of money and effort to accumulate samples of common rocks and minerals for the classroom or for collections. In actuality, we live near excellent exposures of a large variety of rocks and minerals that could be collected in two or three Saturday trips from the Modesto area. Basalt: Table Mountain lavas are made of a black volcanic rock that looks like basalt (it is actually a rare type of lava called latite). It can be found along Highway 108, especially near Knights Ferry, and Yosemite Junction. Andesite: Gray volcanic rock that originates in eruptions from mountains like Shasta, Rainier or Fuji. It was erupted from vents around the Sierra Crest from Sonora Pass north around 20 million years ago, and can be found as cobbles in streambeds like the Stanislaus River. Rhyolite: Light colored or pinkish volcanic rock that is produced by violent eruptions. 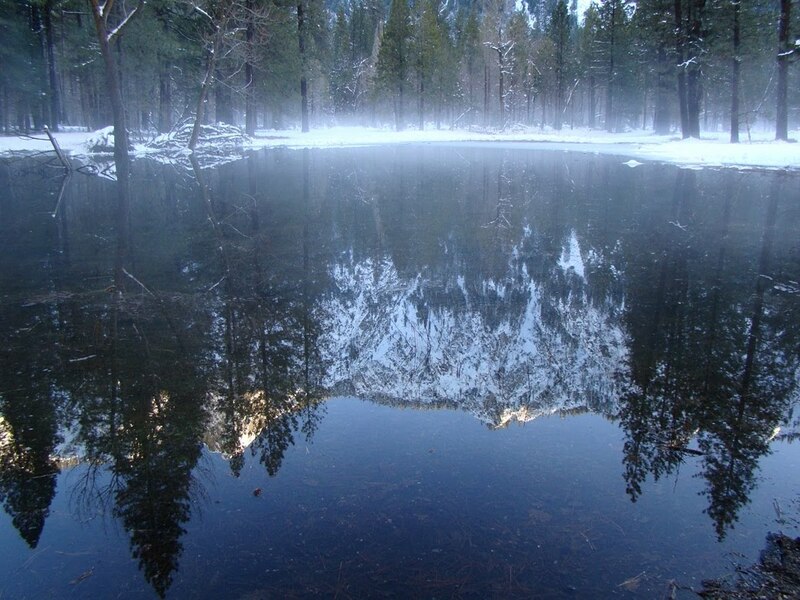 The Valley Springs Formation can be found in the Sierra Nevada foothills from the Tuolumne River drainage north to, well, Valley Springs. It was once used as building stone in some Gold Rush-era buildings. The light colored cliffs along Highway 132 between Waterford and LaGrange are rhyolite ash deposits. Other exposures are found along the Stanislaus River upstream of Knight’s Ferry. Obsidian and Pumice: These are both forms of volcanic glass, the first solid and shiny, the second, frothy. Obsidian is not normally found in the region, except as artifacts like arrowheads that were carried into the area. The rocks are found east of the Sierra Nevada in the Mono Craters area, and at Medicine Lake Highland northeast of Mt. Shasta. 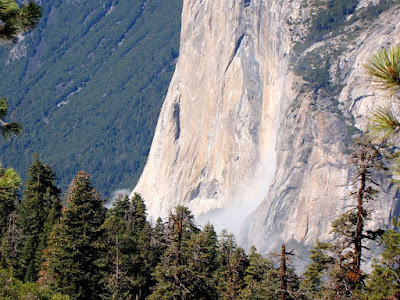 Granite: Granite is well-known as the rock of the Sierra Nevada, although the rocks found in Yosemite National Park include many types of similar “granitic” rocks such as granodiorite, tonalite, and diorite, and actually not a whole lot of granite! 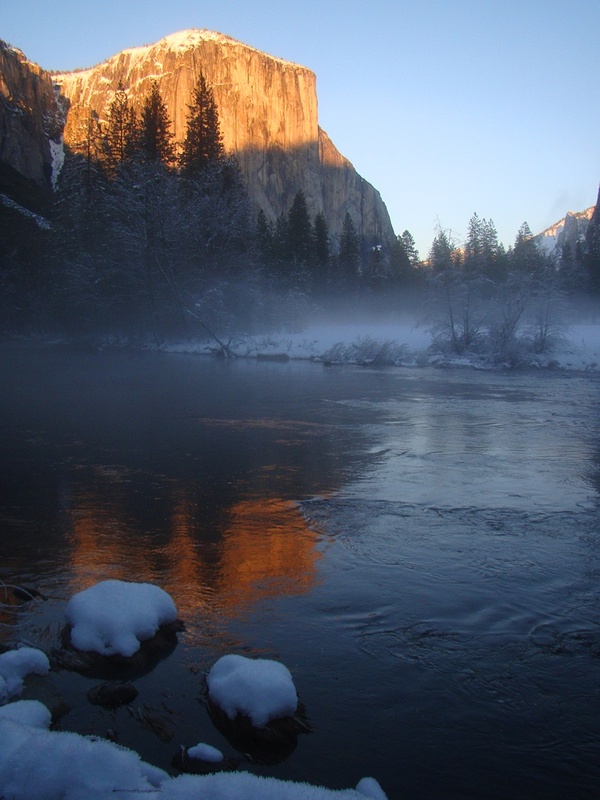 Collecting is not permitted in the national park, but many cobbles of granitic rocks can be found in the Merced River on Highway 140 just outside the park, and in the upper drainages of the Stanislaus River on Highway 108. Gabbro: The dark plutonic igneous rock is sometimes incorrectly called “Black Granite”. It is relatively rare, but can be found locally in at least two places, in Del Puerto Canyon above Patterson (just beyond the quartz mine), and along Highway 140 between Cathy’s Valley and Mariposa. Peridotite: This rock comes from deep within the earth, and is quite rare at the surface. It is often altered even when it is exposed. 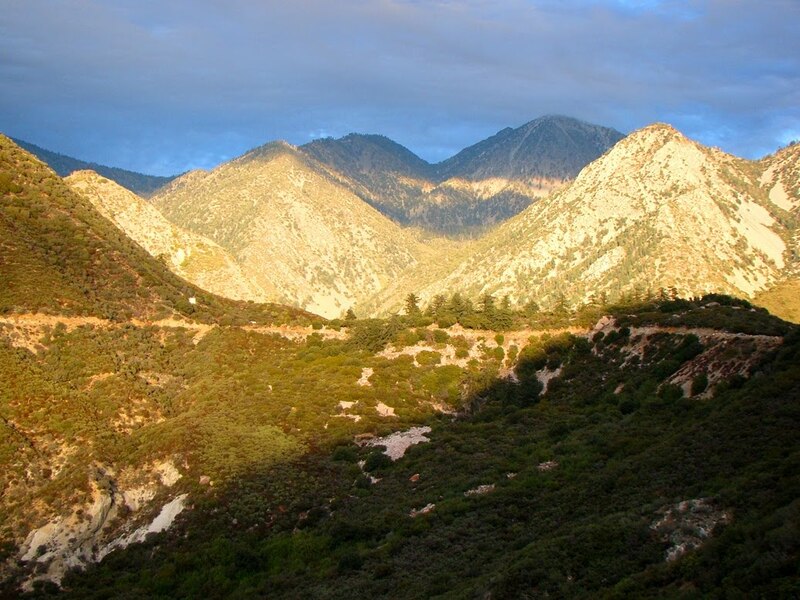 Some relatively unaltered peridotite can be found in the uppermost reaches of Del Puerto Canyon (about three miles beyond Frank Raines Park), and near the site of the old Pinetree Mine at the brink of Hells Hollow on Highway 49 about 12-13 miles north of the town of Mariposa. Sandstone and Siltstone: The Central Valley is underlain by several miles of layered sediments ranging in age from 140 million years to the most recent floods of our local rivers. Luckily, these layers have been pushed up to form the eastern edge of the Coast Ranges where they can be easily observed. Del Puerto Canyon is an ideal place to find a variety of shale, siltstone, conglomerate and sandstone samples. The layers are exposed in the lower 7-8 miles of the canyon. Fossils are occasionally found, especially in the first two miles of the canyon, where leaves can be discovered with a bit of work. The partial remains of a Hadrosaur dinosaur were found in the 1930’s. Gypsum, Coal, and Limestone are not common in the area. Vast limestone exposures can be found in the White-Inyo Mountains east of the Sierra Nevada. Slate and Greenstone: The Sierra Nevada foothills are composed almost entirely of slate and greenstone, the products of heating and deforming oceanic muds and volcanic flows. Individual sites are widespread. Dredge tailings, such as those found between Snelling and Merced Falls on the Merced River, are good places to find cobble-sized samples. 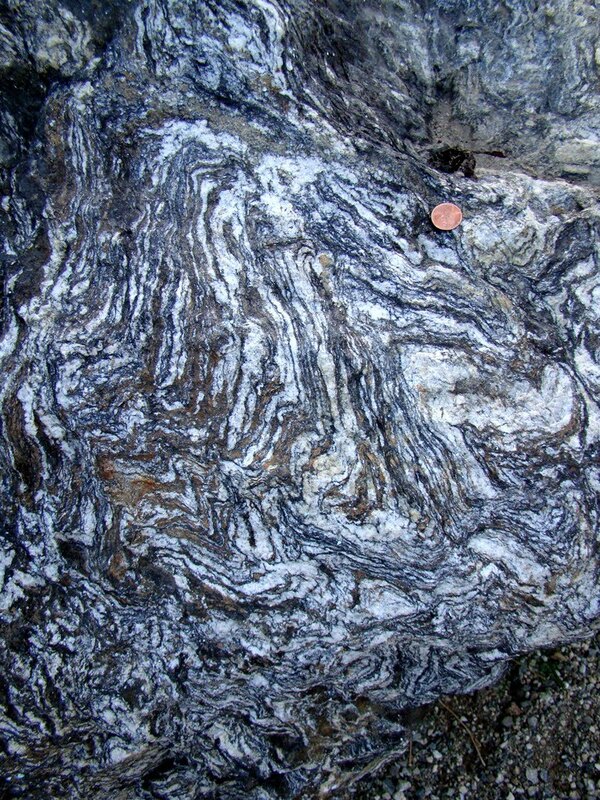 Marble: The Sierra Nevada foothills east of Highway 49 contain a number of excellent exposures of marble. Not surprisingly, the location of caverns is an excellent clue. Columbia, Camp Nine Road, Moaning Caverns, and California Caverns are good places to start. 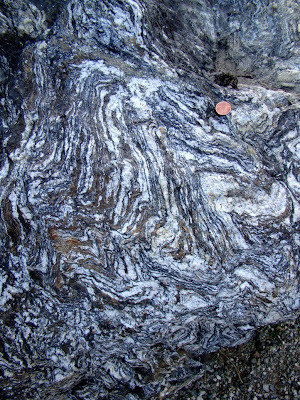 Quartzite: Though less common than the previous rocks, quartzite is occasionally found in the higher parts of the Sierra foothills. Because it is a very hard and resistant rock, the best place to find samples is in streambeds and dredge piles (Merced and Stanislaus rivers). Serpentine: The California State Rock! The former mantle rock is found along major faults in the Sierra Nevada foothills along Highway 49, and in the Coast Ranges, especially in the upper part of Del Puerto Canyon, just beyond Frank Raines Park. 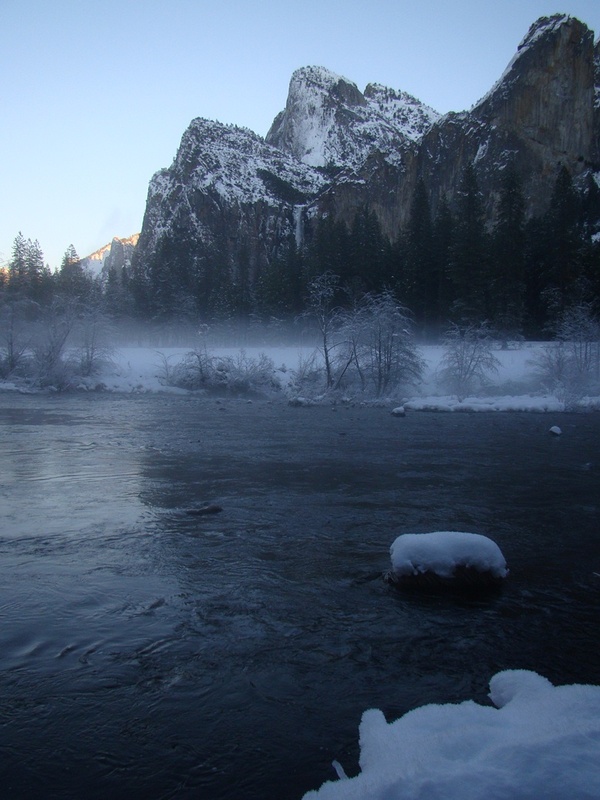 Two of the best exposures are at the base of Bagby Grade where Highway 49 crosses the Merced River, and just north of the town of San Andreas. Schist and Gneiss: These are not common in our area. The extreme southern end of the Sierra Nevada near Tehachapi Pass, and the San Gabriel Mountains of southern California have exposures of these rocks. Further afield, Death Valley (no collecting), and several mountain ranges in the vicinity of Las Vegas are other good localities for finding them. 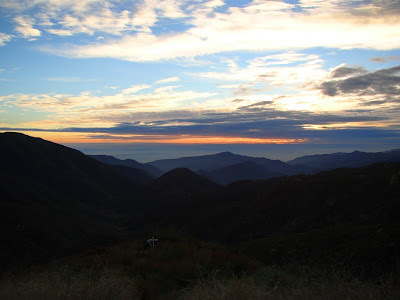 As sort of a postscript to my previous post on the Glendora Ridge Road, I wanted to mention what's visible to our Other California explorers if they look south from the highway. There is a deep dark valley down there...and it's a forbidden valley. When I was a young man living in the valley below the San Gabriel Mountains, I studied maps of Angeles National Forest obsessively, and I climbed nearly every named mountain peak in the vicinity (with the prominent exception of Iron Peak, aka Sheep Mountain). 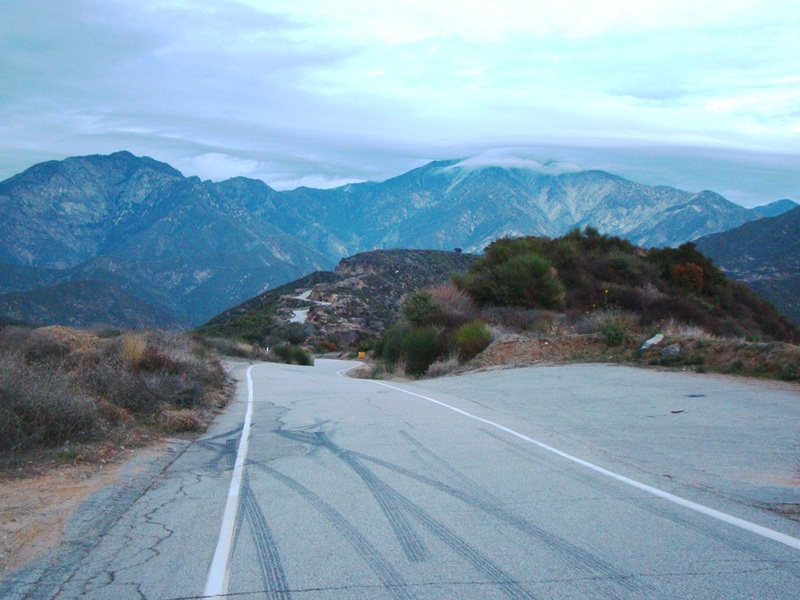 But there was a blank spot on the map south of Glendora Ridge Road. It was labeled "San Dimas Experimental Forest - No Entry". And that was it. No explanation. In those pre-internet days, there wasn't much I could do to find out what secret and nefarious experiments were being carried out in that valley. To me, it was sort of a national forest "Area 51". And of course, it seemed so unfair that we couldn't explore the area, with the meadows, waterfalls and creeks that must be hidden in the folds of the valley. When I returned to the region a few weeks ago after a long absence, I found it was not nearly so hard to find out what the experimental forest was all about (the internet is kind of nice that way). 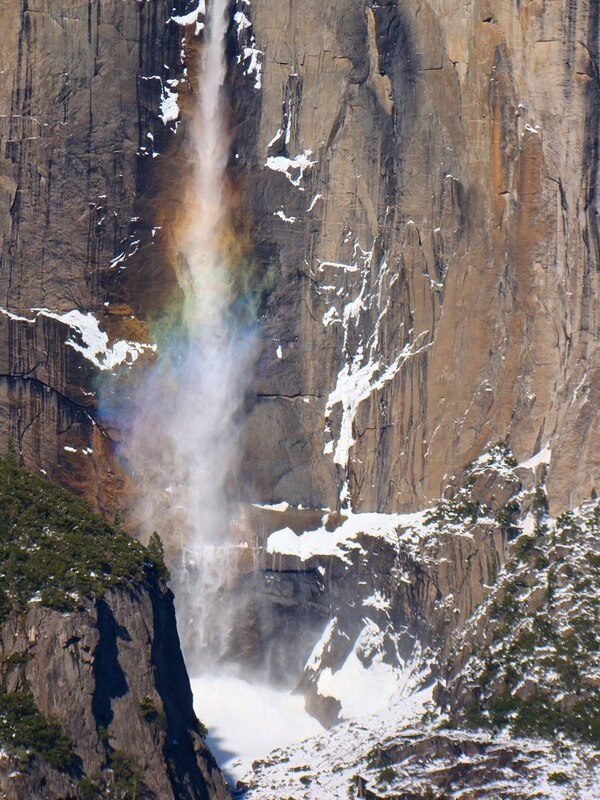 It was originally established in the 1930s to study ways of increasing water yields in the lower canyons. 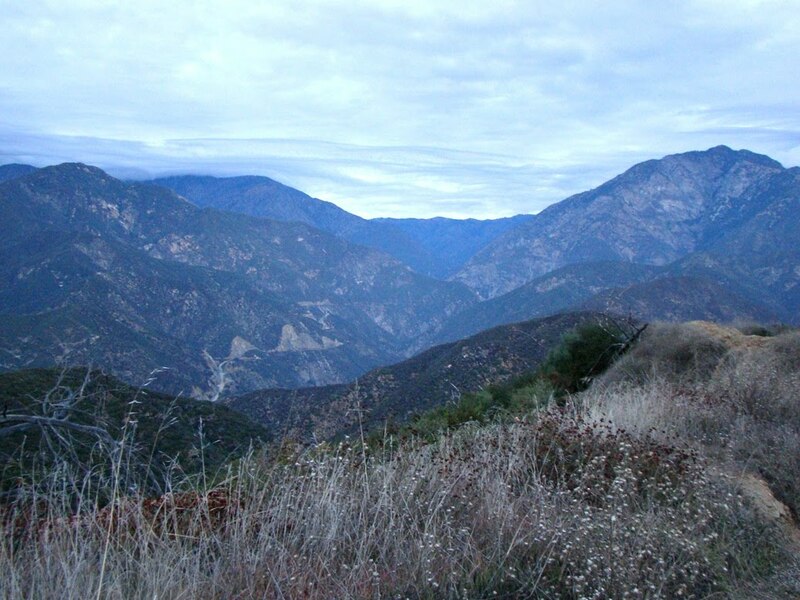 The role of the experimental forest evolved over time to become an important baseline region to study the vegetation, soils, slopes, water, air, and fauna of the chaparral plant communities of Southern California. 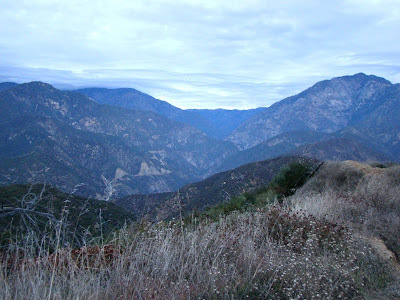 Most of Angeles National Forest has been developed for a variety of uses (the "multiple-use" conundrum), and there are few areas that have not been severely influenced by human activities. 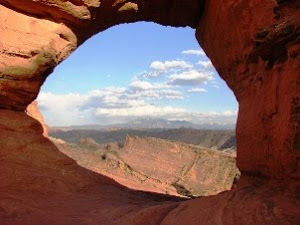 The canyon is truly an open-air laboratory, and although it is not open for recreational use, it isn't that difficult to arrange educational tours, or conduct original research using the lab facilities in the lower canyons (with a database of more than 70 years of measurements and observations) . The San Dimas Experimental Forest is now part of the Pacific Southwest Research Station, which consists of more than a dozen such areas in California and Hawaii. It is also recognized as a Biosphere Reserve by UNESCO's Man and the Biosphere program. For the mysterious forbidden valley of my youthful days, that's pretty cool! But darnit, where is the UFO landing pad? OK, not quite as deep as the Grand, but who's to quibble over a few hundred feet? 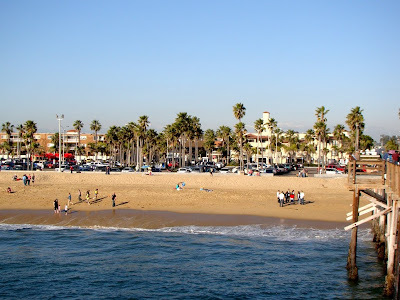 That's what I love about California: it has a lot of famous places that everyone has heard about, places like Yosemite, Death Valley, and Big Sur, but it also has many corners that are known locally perhaps, but are not all that prominent in the public consciousness. They are parts of state parks or national forests, sometimes private lands, and they offer geologic treasures that would be national landmarks in any other setting. 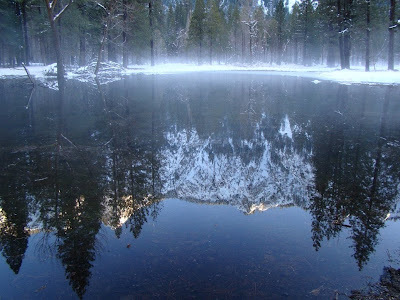 That is the theme of my sporadic posts on the Other California, a description of these unheralded places. The beautiful skyline in the photo above comes from the high point on the Glendora Ridge Road, a paved highway with no picnic areas, no campgrounds, no signed overlooks, and no particular destination or purpose that is obvious. 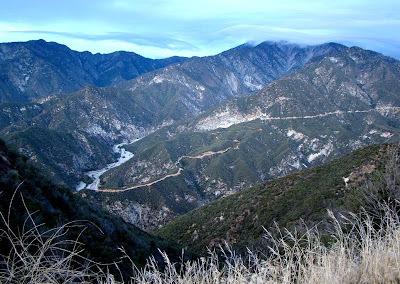 The road connects Baldy Village at the east end of the San Gabriel Mountains with roads rising out of the San Gabriel River and the urban sprawl of the Los Angeles Basin around Glendora and San Dimas. The other trail to the summit starts at Baldy Village and climbs almost 6,000 feet to the summit. To call this a difficult trail is nearly an understatement, but climbing it was one of the great adventures of my youthful days. Hot and dusty in the lower reaches, and spectacular views the whole way up. It's a good place to catch sight of the bighorn sheep. There is no official Sheep Peak, by the way. It is the informal name of the prominent peak in the center of the wilderness area, 8,007 foot Iron Mountain (the prominent peak on the right in the picture below). I've never had the privilege, but the climb to the summit is said to be one of the toughest hikes in the south state, with great views and a chance to explore some old gold mines along the way. 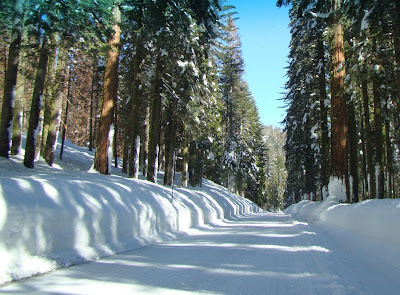 Glendora Ridge is paved and well-maintained. That it exists is kind of a mystery to me, and I welcome any explanations as to why it was built. According to Russ Leadabrand (a travel author and Sunset Magazine contributor in the 1960s and 70s), the road was constructed in the early 1930s. I have thought of one possible reason. After my comments a few weeks back about the hazards of living in Southern California, especially adjacent to the high mountain ridges, it occurs to me that Baldy Village would have but a single access road if Glendora Ridge Road wasn't there. A single way out in the event of a major earthquake, a major flood, a major fire, or big landslide. 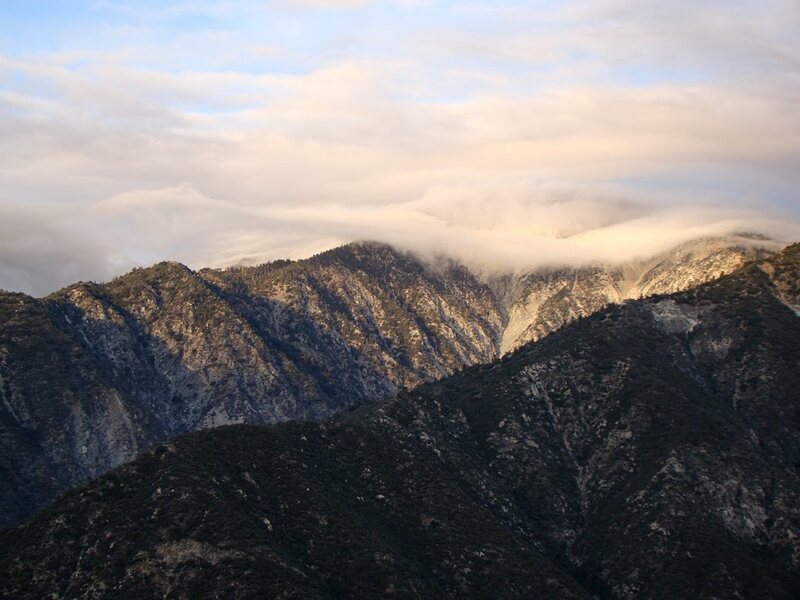 The same problem applies to the developments in San Gabriel Canyon off to the west, a highway that also connects with Glendora Ridge. It looks to me like Glendora Ridge Road is the evacuation route... Whether it is or is not the escape route, it is a great road to drive. Unfortunately the local kids with their newly minted driver licenses know about it too, and a Google search on the subject of the road is likely to turn up stories of tragic car crashes as much as anything else (one of my high school buddies survived a 400 foot plunge off the highway). But for us last month it was uncrowded, and with the clear December skies, a beautiful excursion looking towards the high mountains, and the crowded valleys below. approximately 1,700 cubic meters (5,000 tons). learn more about this complex process. Check out this incredible video of flash flooding in Queensland, which came to my attention courtesy of Yorrike on Twitter. A couple of thoughts on the event: As I watched, I thought "why aren't these people moving their cars out of the way?". Of course, hindsight is wonderful, and one can't know how bad the flood is going to be until one's car is floating away. Then again, midway through the video, a fellow is seen moving his car, and I suddenly realized how unwise that could have been, given how easily the other cars floated away. On a sedimentary note, at the end the cars display imbrication, which is something pebbles do in a stream that allows us to see which way water was flowing (a paleocurrent indicator). I can't tell if the cars are oriented correctly, but the similarity to the cobbles below is striking. This picture is from Andrew Alden's About Geology Page, and this link is a good place to find out about imbrication. Please pray for us. There are many people who are suffering through this. It was a gloomy day Wednesday in the fog of the valley, and a beautiful sunny day in Yosemite Valley. I gathered a few more pictures from the day to add to yesterday's collection. 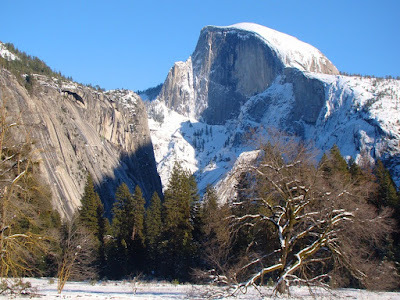 I have lots of pictures from many trips to Yosemite, but I don't think I've ever been there when there was so much snow and ice. Above is Sentinel Dome, one of the slightly lesser known icons of the valley, a cliff that would be a more famous landmark if there weren't Yosemite Falls on the opposite side of the valley to distract everyone. 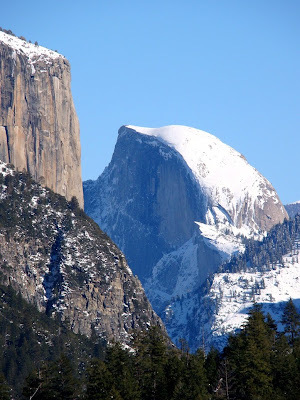 Half Dome is pretty much the most famous rock in Yosemite Valley. When one rounds the corner on the road from Crane Flat, El Capitan and Half Dome make a memorable debut (enhanced a bit here with the zoom lens). Ice has a hard time sticking to the face of El Cap and Half Dome, but the snow nicely coats the summit. 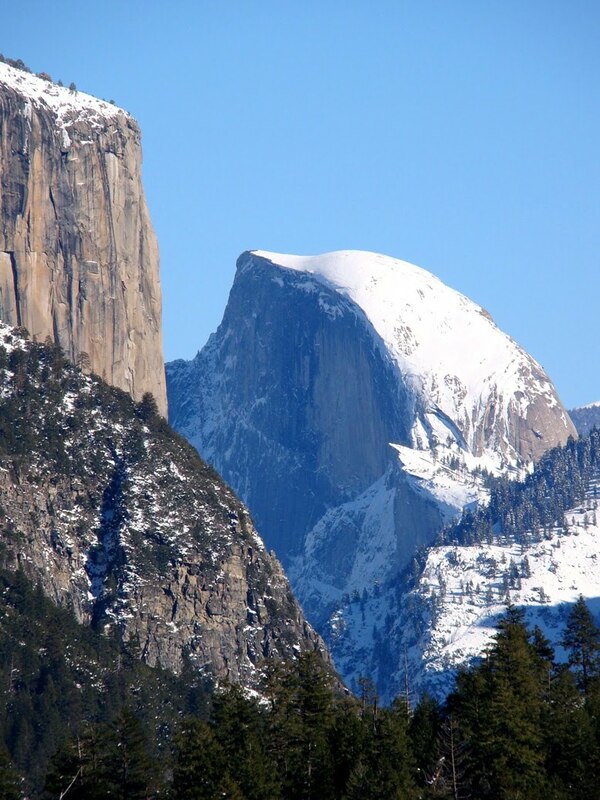 Hmm...I don't think anyone has ever thought to take a picture of Half Dome from this angle...from the middle of the parking lot at Curry Village. I've taken this picture about a hundred times, maybe more, but again rarely with so much snow. There is a single telephone wire that gets in the way of pictures in the parking lot. One has to shift around a bit to make sure it doesn't show up in the image. The Cathedral Rocks take on a whole different aspect in the late afternoon shadows. Mist rises from the meadows as the temperature quickly drops. Turtleback Dome is usually visible from the Crane Flat road, but it can sometimes be a little hard to see the glacial erratics scattered across the summit of the dome. Erratics are boulders left behind during the one of the early glacial episodes that filled Yosemite to the brim. 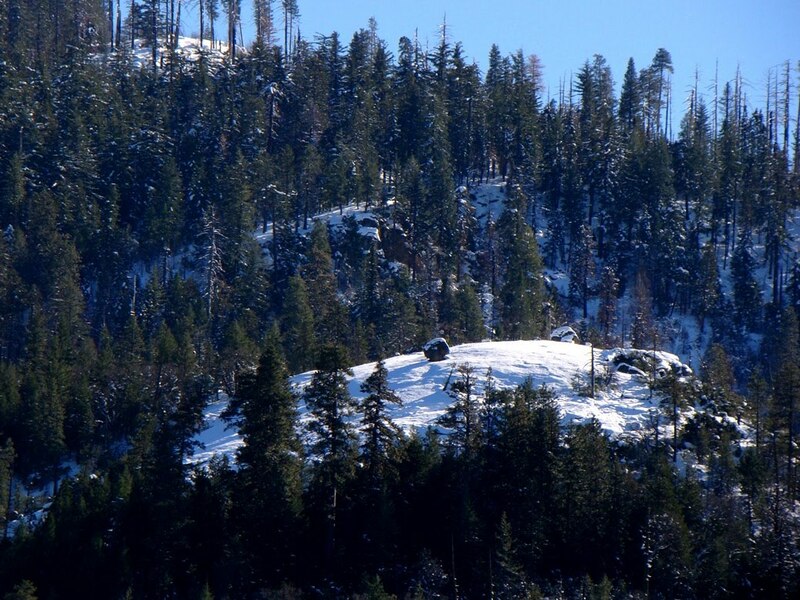 The snow highlighted the boulders yesterday (below). Ice was everywhere. 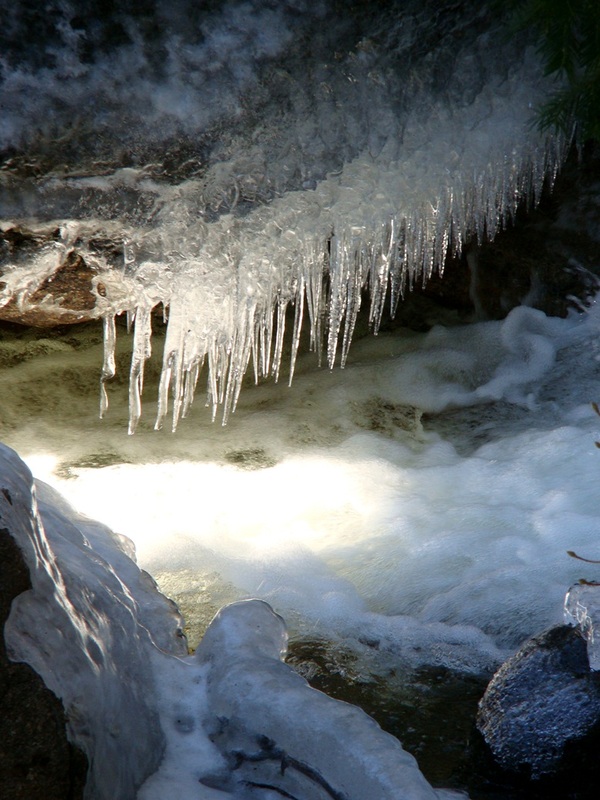 We caught these icicles along Cascade Creek. 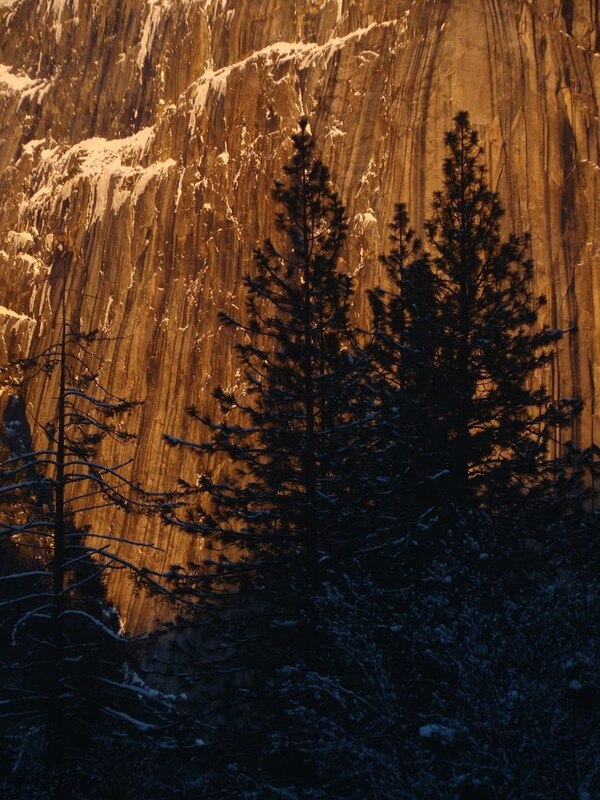 Our national parks are precious places. As I noted in this morning's post, I needed to decide whether to be fully prepared for the new semester, or be irresponsible and let a few prep items wait until the weekend. 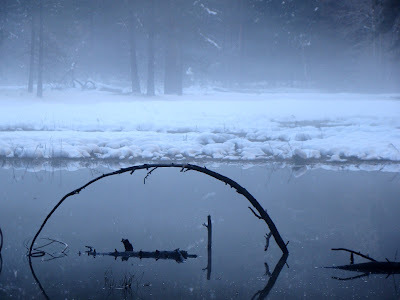 Logic won out, so we headed up the road to get out of the fog for a few hours and see what winter in Yosemite could provide us. What a day! Have I ever mentioned that I drive a Subaru? With the all-wheel drive that I am really happy with? I passed everyone putting on their snow chains and took the Big Oak Flat Entrance road to Crane Flat, which at 6,200 feet was beneath several feet of fresh new snow. The trees were weighted down, and there was a constant rain of snow chunks off the branches and onto the ground (and cars) below. My car didn't crash into anything or spin out (possibly because I was going about 12 mph...). That's one of the nice things about California: we get to visit the snow if we want to, but we don't have to live in it unless we want to. 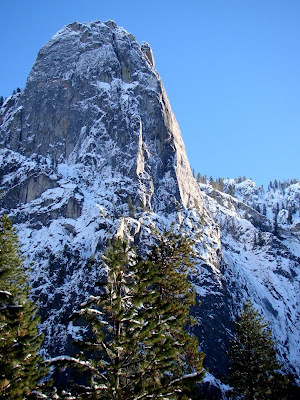 So many of the usual wonderful sights in Yosemite Valley take on a completely different aspect under a mantle of snow and ice. 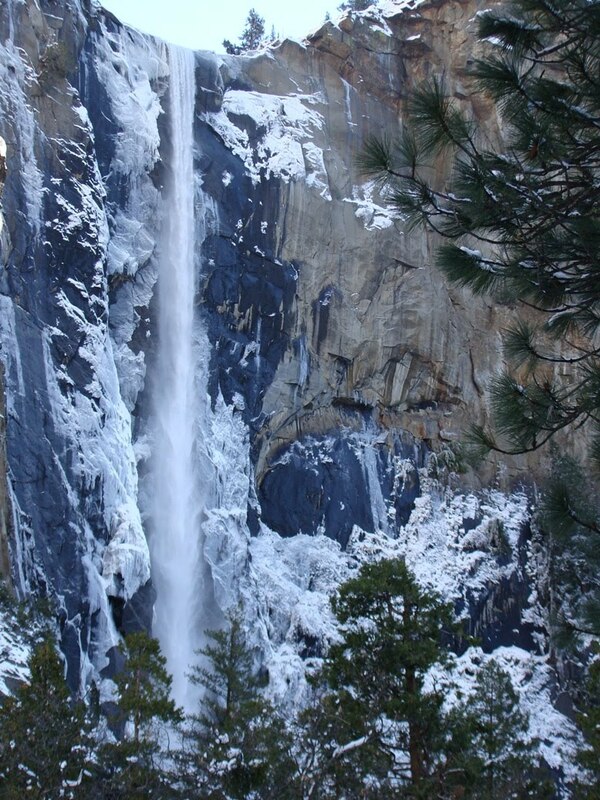 Bridalveil Fall (above) and Cloud's Rest were coated with ice, looking most unlike their summer selves. 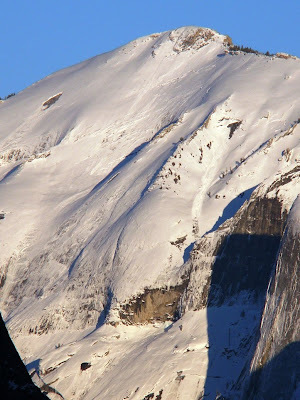 The furrows on the northern slope of Cloud's Rest are avalanche chutes, and several fresh slides can be seen in the photo (click on the photo to enlarge and check below the two barren spots). One of the most beautiful trees in the world had barren snow-covered branches, and a few broken ones, but it will be back in the spring. I'll have to take a closer look on a warmer day; I always assumed it was an oak of some kind, but I've heard it called an elm tree (I'm open to corrections, I'm a geologist, not a botanist!). 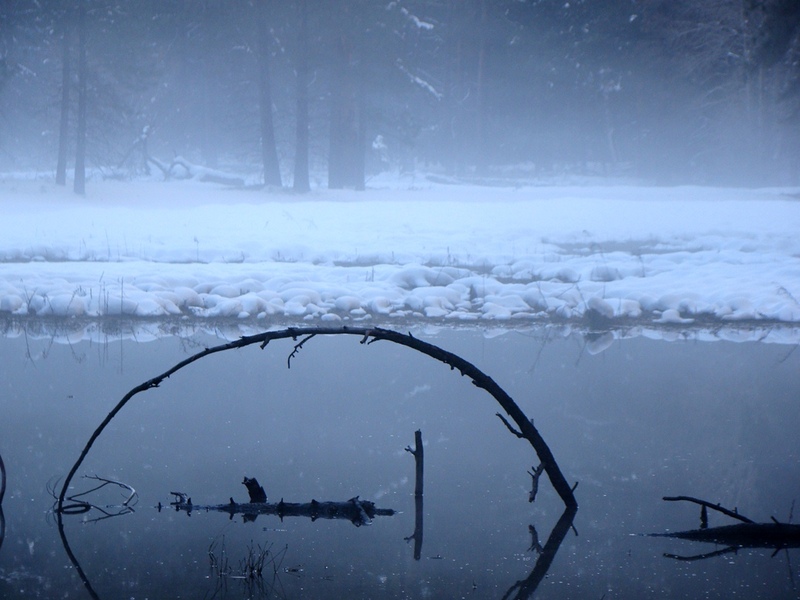 The snowdrifts melt into ponds in places that are normally meadows during warmer seasons. The Cathedral Rocks were nicely reflected on the water in the meadow below. The last gift of our journey was one of the locals hanging out along the highway near the park exit. 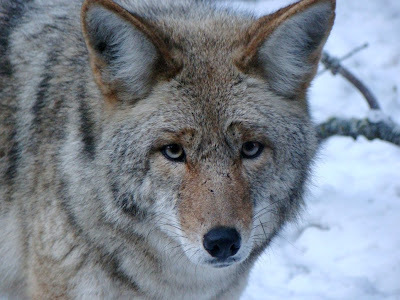 I know the coyote looks like he is thinking deep carnivorous philosophy, but he was mostly asking for a handout. 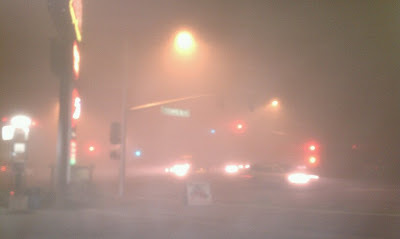 We waved and moved on, back down the hill into the valley fog and darkness. The Tule Fogs have arrived with a vengeance in California's Great Valley (Central Valley). After a series of very wet storms over the last few weeks the ground is saturated with water, but the storms are done with for the moment. This is a relief for anyone in the path of mudflows and flooding, but the stagnant air in the valley results in a temperature inversion with cold dense air below, and relatively drier air at higher levels. 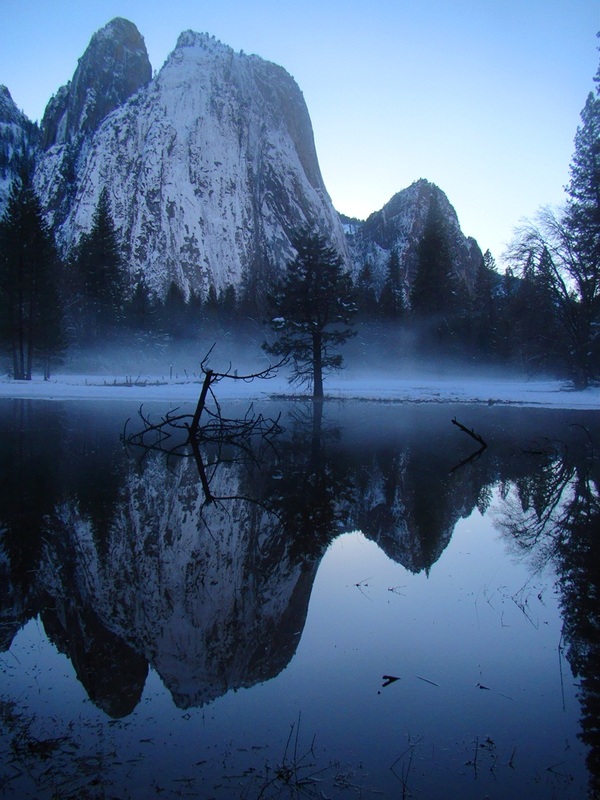 As the ground loses heat by infrared radiation, water vapor reaches the dew point and clouds form at ground level. The fog can be dangerously thick, with visibility measured in tens of feet sometimes. Driving in the fog is not unlike driving with cotton balls stuffed behind your sunglasses, and we have had some legendary chain reaction accidents involving dozens of cars on Highway 99 and Interstate 5. I don't like the fogs very much. I don't like driving in them, and I hate that I am wandering about in the gloom, knowing that the sun is shining brightly just a few hundred feet over my head. School starts on Monday, so I should be getting everything ready; the syllabi are in fact done, and I spent a few hours cleaning up the lab yesterday. 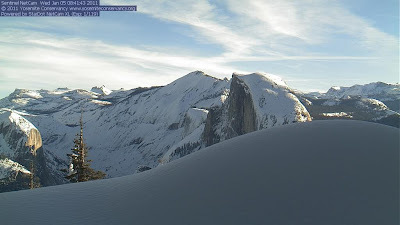 I'm kind of ready; there is a lot more I could be doing...but...I chanced on the webcam of the Yosemite Conservancy this morning, and...well...I'll see you all later, I've got one more field excursion to make before the semester starts!